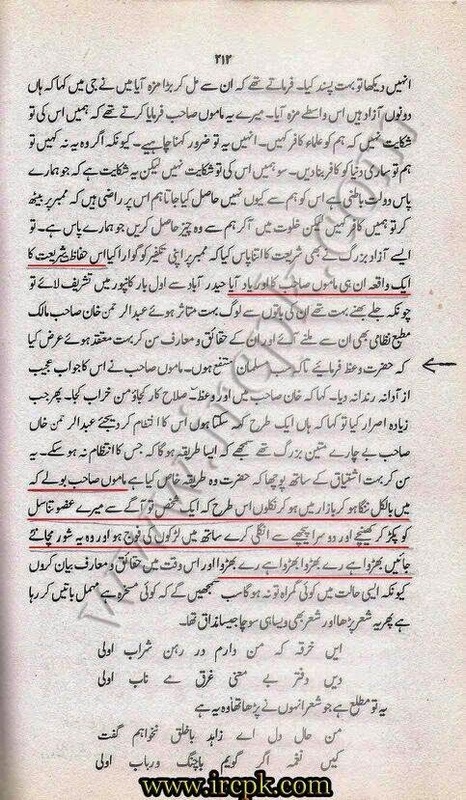 Ashraf-us-Sawaneh vol.1, p.12 – A strange incident is mentioned in Ashrafus-Sawaneh (biography of Ashraf Ali Thanvi) about the great-grandfather of Ashraf Ali Thanvi, Muhammad Fareed. He was accompanying a marriage procession when it was attacked by a band of thieves. Muhammad Fareed died defending the procession and was buried near the tomb of Pir Samauddin. An Urs (festival) was held at his grave for many years. The biographer writes, “After his martyrdom a strange incident occurred. At night, he returned to his home as if he was alive and gave some sweets to his family members saying, ‘If you do not tell (about my visit) to anyone, I shall keep coming this way.’ But the family members feared that the people may suspect something wrong when they see the children eating sweets, so they disclosed the incident and after this he did not return.